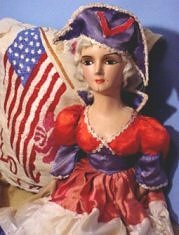 The large composition bed doll with V for Victory is a patriotic tribute to the era. Not really a military, but a patriotic doll appropriate for this section. The Royal Air Force flyer was Reliable of Canada's contribution to the war-related Military dolls. Using the same mold as the "Mountie", he is a cloth body doll stuffed with an excelsior type material, composition head and hands. 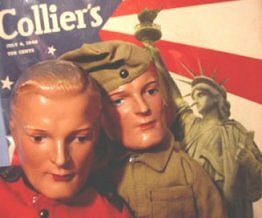 eBay has a rather large set of listings of vintage World War II dolls for sale, if you are interested in a purchase, or to find values if looking for costs, it is necessary to register with eBay. The Mountie. 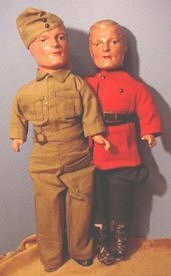 When I first started collecting dolls, this particular doll was referred to as "Nelson Eddy" due to a character who was a Royal Canadian Mountie that he portrayed in a movie with Jeannette MacDonald. The doll does bear a very striking resemblance to the actor, but in more recent books, the reference to Mr. Eddy is seldom mentioned if at all. This is one of the many changes in the world of doll research. Nothing is written in stone, and as time moves on precise accuracy becomes more challenging to maintain or obtain. But...he will always be Nelson Eddy in my own collection! Both dolls are the same identical mold, only the uniforms define the character. Even the Lone Ranger and Tonto who were also produced by Reliable of Canada had the same identical facial structure and features, but only the hair is darker. 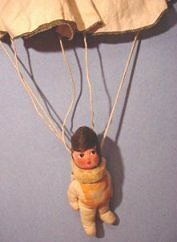 If you have a display of World War II Military Dolls, nothing completes the scene like a "Raggy Doodle, US Parachute Trooper" doll. This information is stamped on the parachute. Any manufacturer information has faded away. He is all cloth complete with cloth parachute. It seems that the supply of this type of vintage dolls is becoming less and less every day, much like the "Greatest Generation" of fighting men and women of World War II. A search on eBay will bring up a few leftover remnants of the World War II era.